Shaykh Fath al-Mowsily relates, once I saw a young boy walking through the jungle. It appeared as if he was uttering some words. I greeted him with Salaam and he replied accordingly. I inquired, "Where are you going?" 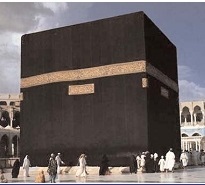 He retorted, "To the house of Allah (Makkah)." I further asked, "What are you reciting?" "The Qur'an" he replied. I remarked, "You are at a tender age, it is not an obligation that you are required to fulfill." my feet's are my conveyance." I explained, "I am asking you regarding bread and water." He replied! "Oh Shaykh if someone invited you to his house, would it be appropriate to take your own food?" I exclaimed, "No!" "Similarly, My Lord has invited His servant to His house, it is only the weakness of your Yaqeen that makes us carry provisions. Despite this, do you think Allah will let me go to waste?" "Never" I replied. He then left. Sometime later I saw him in Makkah. He approached me and inquired, "Oh Shaykh are you still of weak belief?"